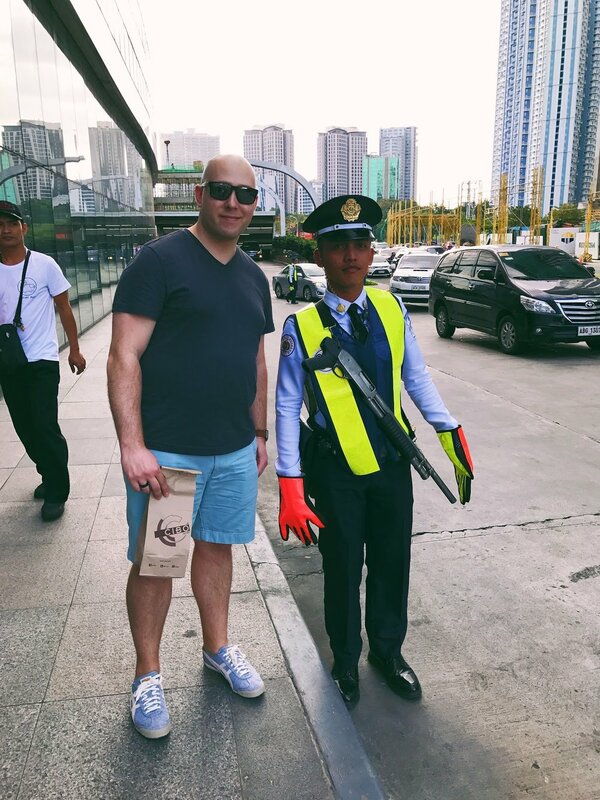 Here's a picture of me (*not Vin Diesel) with the SM Aura mall security guard carrying a rifle. Hello there! My name is Matt, and I am married to one of the BOSFilipinos co-founders, Bianca. I’ve always lived on the east coast, sharing my modest time on this earth between New York and New England. I never really traveled before I met my wife. I was always told you can travel and explore the world with your partner-in-crime, but I never expected the chance to see and experience the Philippines. The traffic is unreal. You will only understand this once you go there. My wife and her friends complain constantly about the traffic in the Philippines. You can only understand how bad it really is when you are actually in the middle of traffic in Manila. The night we arrived, we were welcomed by the heavy, dense, humid, post-rain air. We gathered up our bags and hopped in the family car. We made our way into the heart of Makati, the business district. As we got further and further from the airport, I was nearly blinded by these massive electronic billboards, none like which I have ever seen. I made the mistake of changing my focus to the road in front of us. And to the left of us. And to the right. We were sandwiched in what appeared to be gridlocked traffic. I started to learn very quickly that the traffic here is intense, but it is also an ordered chaos. So much so that we were often inches from giant tour buses and jeepneys (Filipino jeep taxis). There is a certain sigh of relief you get once you descend from the highways of Manila and make your way towards the subdivisions (gated residential areas). Filipino Breakfast is the best. We ate outside in the mornings, on the back porch. The cool, balmy morning breeze lifted the rich scent of soft garlic fried rice, called sinangag, from the confines of a hastily set table. The true definition of eating family style in the Philippines features multiple dishes and suitable condiments, all sharing space on a lazy susan. I would often pair the sinangag with itlog (fried egg) and longganisa (Filipino sausage). This common breakfast combination is appropriately called longsilog (the combination of the words longganisa, sinangag, and itlog). The creamy egg yolk, folded into a warm bed of rice was perfectly complemented by the rich crunchiness of the sausage. I would wash it all down with a refreshing glass of fresh calamansi juice. Calamansi is a Filipino citrus fruit, small and round, looks like a baby lime, and very tart in flavor. Upon completion of this carb- and protein-rich greasy delight, Bianca’s dad would come bearing fresh mangoes from a local market. Without a doubt, these are the best mangoes I have ever had. This would be another staple item to my meals while at my in-laws. It turns out that these are in fact not even very good mangoes, because they were not in season during the time we visited (January). Filipino mangoes, like most mangoes, are best in the summer. Could have fooled me. I’ll take your crappy Philippine mangoes over our “good” US mangoes any day. Graffiti along Diliman Avenue on the way to the UP Town Center mall. The rich and the poor are neighbors. We arrived in the Philippines at night, so the only thing I was focused on was the giant backlit billboards, the angry traffic, and when I was finally going to be able to shower after 30 hours of travel. The first full day we were in the Philippines was the day I truly understood what it’s like to live in a third world country. We spent one afternoon in U.P. Town Center. It is a sprawling mall complex sharing a mix of indoor and outdoor stores and restaurants, in the University of the Philippines area. We ate ramen and I bought a pair of sneakers. Normal activities you might expect in a first-world country. But on the way there, nestled in between our secluded subdivision and the mall, were these small, metal, roughly constructed shanties and storefronts, representing a metaphysical window into the impoverished life that many experience here. Upon returning to Bianca’s home from a day of shopping and eating, I was reminded of the safety and comfort of a gated community, and the surrounding area of elegant Mediterranean-style and ultra-modern homes of their subdivision. Seeing these extremes back to back made me realize how good I have it. It's one of the most interesting parts of visiting the Philippines. Being a minority here is like being a celebrity. I truly understand what it’s like to be a minority now. Fortunately for me, I only experienced the positive aspects of being a minority. There were times in my trip where I could see a lot of heads turning in my direction, people looking up from their lunch to react to seeing a white guy in the same restaurant, and the noticeable pause in conversations when people caught me in the corner of their eye. This isn’t the case everywhere. There are a few communities where there is a relatively large white population, but so few and far in between that even I gawked at white people when I saw them in the mall. I will say that the best, most flattering part was when the family driver told Bianca that I look like Vin Diesel. Just to be clear, I might be a dumb-looking bald white guy, but I look nothing like Vin Diesel. Whether you think that’s a good thing or a bad thing is up to you. Filipino people are some of the most welcoming people in the world. Last, but certainly not least - despite the fact that I am a dumb-looking bald white guy, I never felt like I was the only non-Filipino in the room. At every meal, every celebration, and every other meeting in between, I felt like I have always lived in the Philippines. The way I was embraced by Bianca’s family and friends was nothing short of amazing. I’m looking forward to going back and experiencing the warm hospitality again, seeing more of what the Philippines has to offer, and eating more longsilog. I mean lechon. I mean Jollibee.